Currently they are open until 5pm, but shortly summer hours will be starting and they will stay open until 6pm. In addition the to to unique flavor of their drinks, the staff is awesome, the prices are fair, service is fast and they have the best music to dance to while you wait. All of their coffees and teas are available hot or iced, and for the lactose intolerant or vegetarian crowd almond, coconut and soy milk are available for a .50 upcharge. The last thing that is noteworthy about this locally owned cafe is the owner is socially aware. This past January, Messhugah Shack attending the San Diego Women’s March and offered free coffee to everyone who joined them. 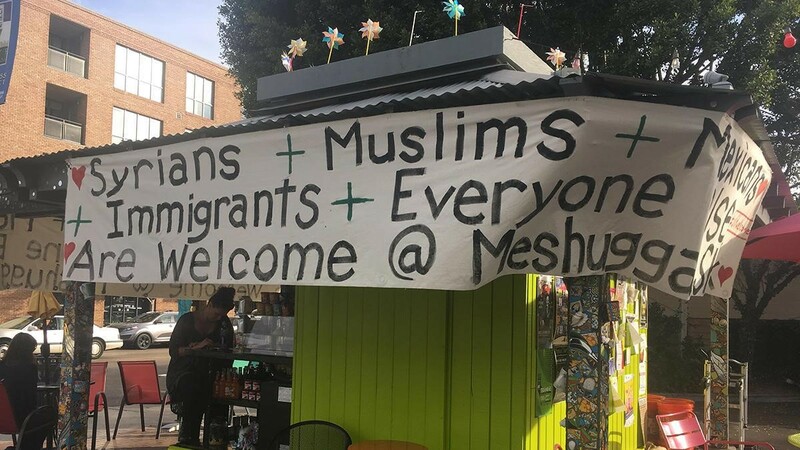 Prior to this, the owner, John Bertsch, put up a sign around the Mission Hills location that read, “Syrians + Muslims + Mexicans + Immigrants + Everyone Are Welcome.” He put this sign up the day after the Presidential Election in order to show solidarity with the diverse community Meshuggah Shack serves.